To begin, I have a January, 2005 Eterna catalog, and a beautiful thing it is. 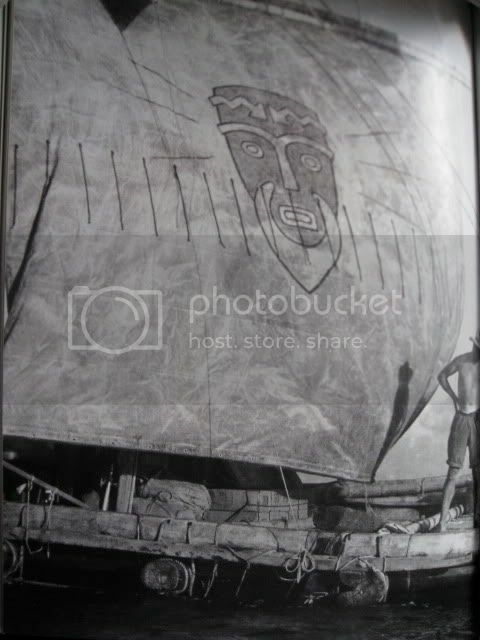 The KonTiki expedition will forever be in the brand's DNA, as Thor Heyerdahl and crew wore Eternas on their 1947 voyage from Peru to Polynesia on a balsa wood raft. 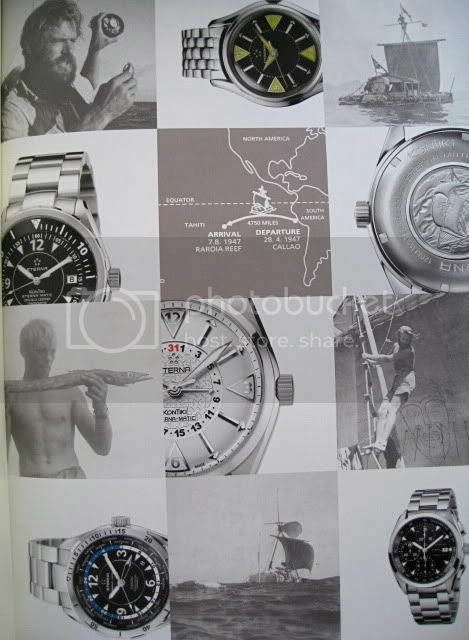 Toward the back of the catalog there were a few pages devoted to the Eterna KonTiki 1000M Concept Diver. This must have been written in 2004. 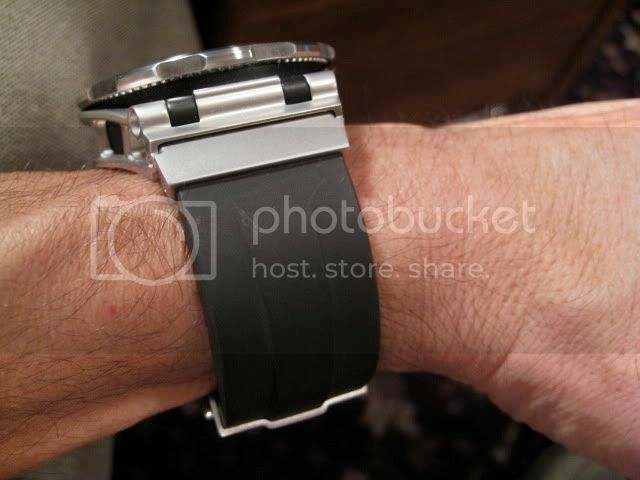 After a phenomenal amount of research and development, the watch was finally released to the public. The European public, that is. There were a couple in the hands of some British watchmen, but that was about it. 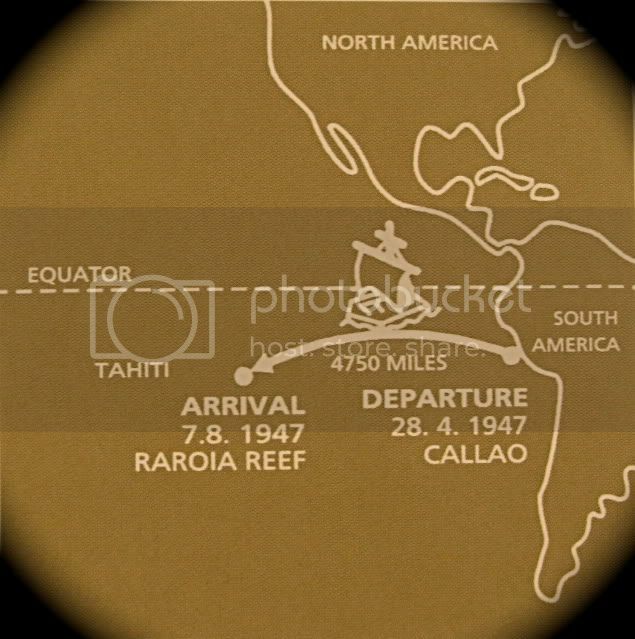 Then (Don) Victor acquired one, perhaps the first in the New World. I was lucky enough to procure one a couple weeks ago. First the dial. Absolutely delicious, though I find it difficult to capture the details as sharp as I'd like. The 5 minute indicia are raised chrome triangles filled with lume (apparently C3). As noted previously. 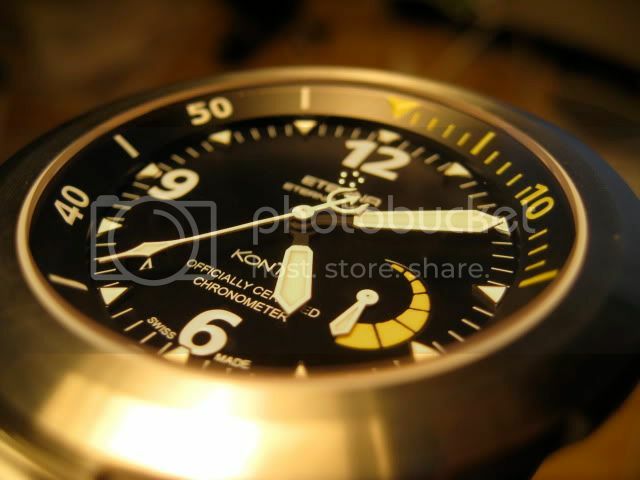 the minute circle on the outer edge of the dial is internal, though operated with the external bezel. The hands are 'the right size', with the lume filled minute hand reaching to the edge of the dial. The hour hand is broad and also filled with lume. The diamond tip of the seconds hand is quite visible and again, lume filled. 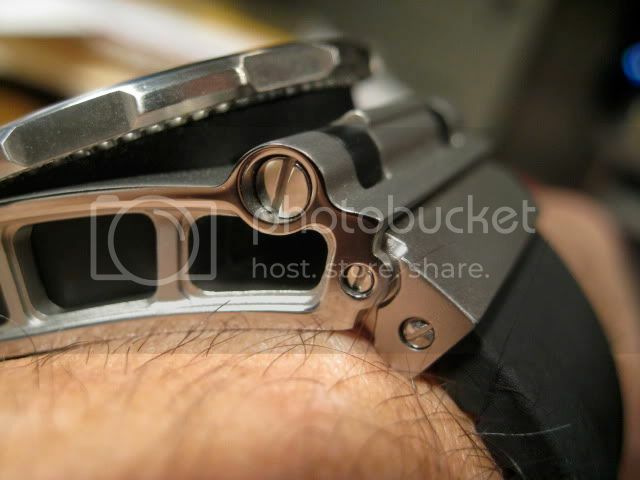 Check out the trident shaped bottom of the seconds hand. I love that. The date wheel may seem oddly positioned, but it's actually discrete and quite legible. I like power reserve indicators that don't hog too much space, and this one fits in harmoniously with the dial. The 5 raised bearings, the signature of the Eterna line, are nicely chromed. The case for the case. The case itself is PVD coated titanium (how I love the sound of that). However, it's held in place by a stainless steel cage, or skeletonized outer case. 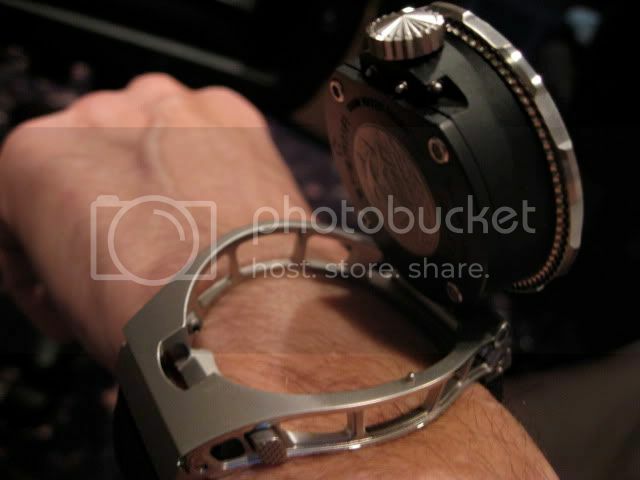 This is so the watch can be flipped up. The size is 46mm x 16 mm. 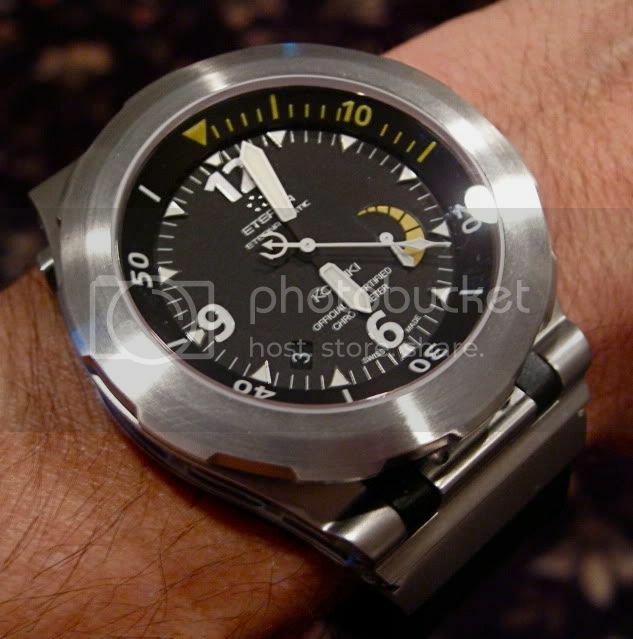 Though Eterna was preceded in the use of flip up cases (Seiko has at least one model with a flip up case), the function here is all Eterna. Pressure applied to the 2 buttons on the upper edge of the case allows the inner case to flip. You can see one on the left in the photo above. When the case is flipped, the outer bezel can be rotated bidirectionally. When the case is locked down, the bezel is immovable. No accidental adjustments. The bezel has a slight resistance, then moves like butter. When the case flips back down, there's a slightly audible and perceptible click. At the top, near the crown, you can see the indent in the case. The 2 ball bearing-type studs toward the left and right of the crown (not the ones facing you) are what hold the case to the cage. 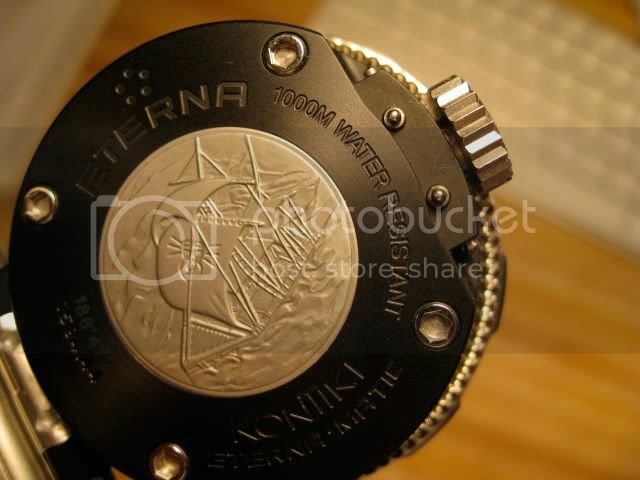 The engraved KonTiki raft is clearly seen on the case back, a hallmark of the Eterna line. And the crown? That is one beautifully carved piece of steel. 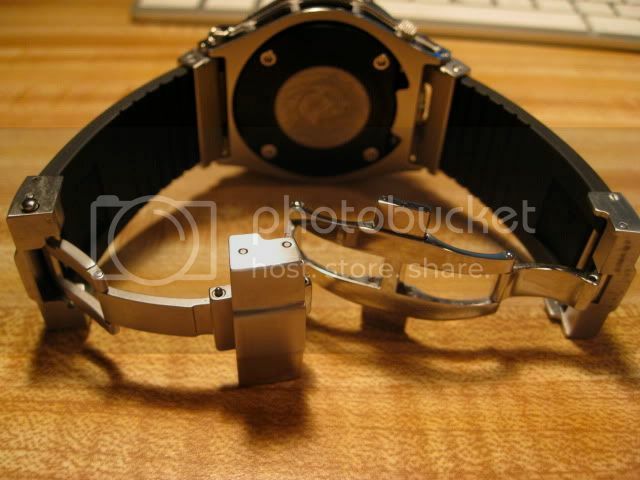 It is only adjustable with the case flipped up, thereby protected when flipped down. It turns easily with the pressure of your thumb (the reason for the fluting) and can be adjusted at depth, even with a gloved hand. It has a unique gasket system and does not have to be locked down for water resistance. The Ti case has a nice matte finish, though the screws appear polished. The stainless cage is also matte, but has just a hint of gloss. Now you'll notice the screws. The larger screw (in the photo above), closest to the case, is for the hinge upon which the case flips. As for the smaller ones, the inner screws function somewhat like a bracelet link, allowing the strap to conform to the shape of your wrist. The outer screws are part of the screw bar system for removing the strap. The rubber strap is Sinn rubber quality. It's quite thick, but wears like almost nothing at all. 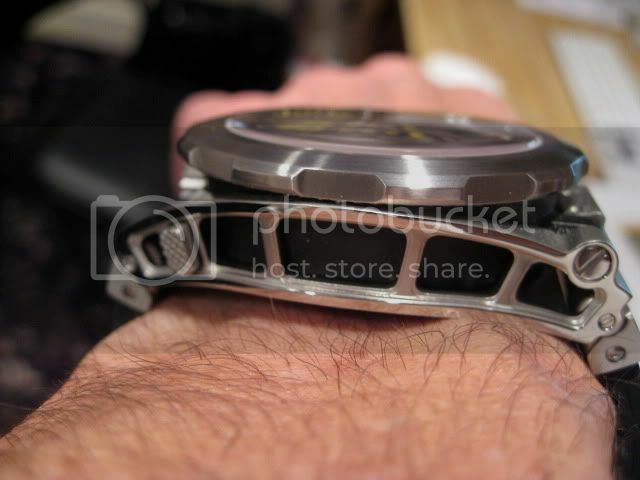 It has to be cut to be shortened like the Sinn, but is deeply scored, making it a no-brainer for placing your scissor. My wrist is 6.5", and there was one indent left. I believe other straps will fit into the hinge. And, who knows? Maybe even mesh. This is one mother of a clasp. Beautiful and rugged. It's a double button release, with an additional release for the diver's extension. The movement: ETA caliber 2897, self winding. Specific Eterna rotor with cote de Geneve. Certified chronometer. 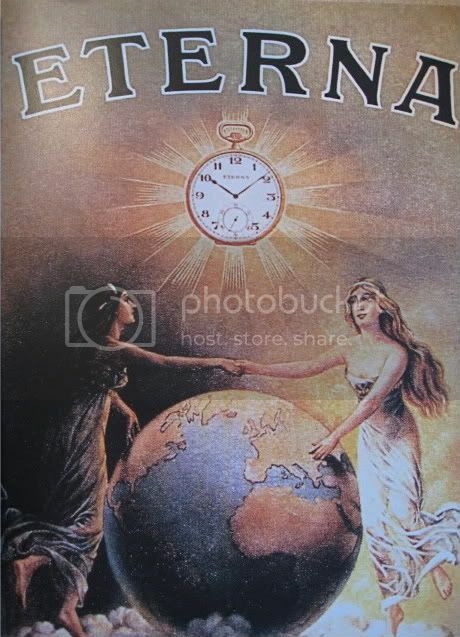 BTW, it was a subsidiary of Eterna that developed the ETA movements. Anything else? 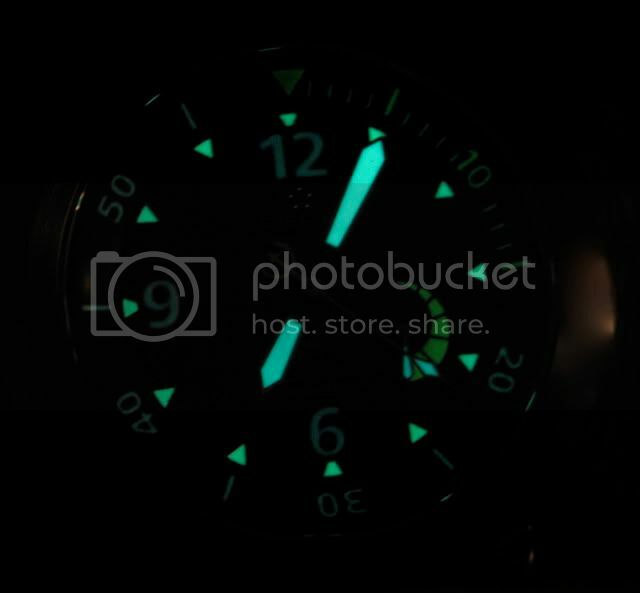 Oh yes, the lume. How can I forget? The 3 hands, as well as the power reserve hand, are blue. The 12, 6 and 9 are a lighter blue. The hour markers are green. The first 15 minute markers are yellow. The PR indicator is also yellow. 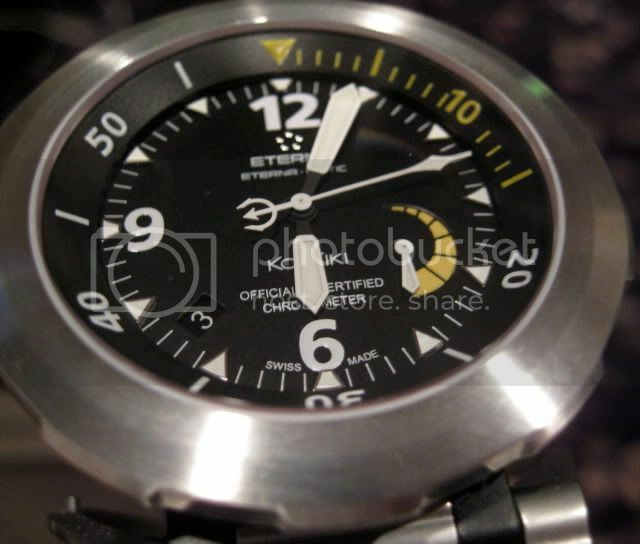 According to Eterna, yellow is visible at greater depth, hence the different colors. The hands glow quite well, the indicia less, the hours and bezel even less. 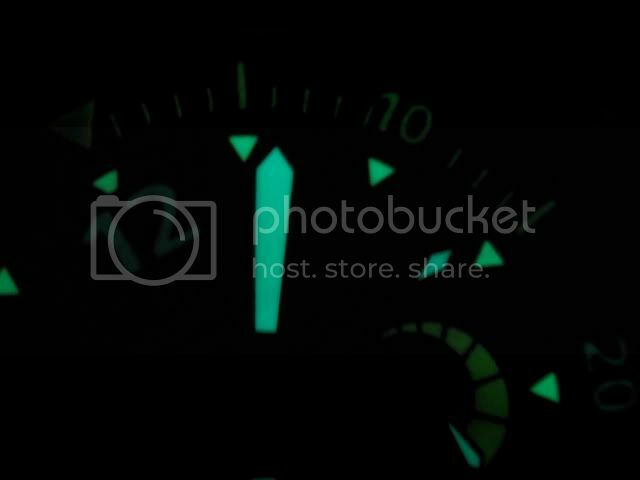 In the photo above, you can see the minute and seconds hands, as well as the PR indicator. Packaging: comes in an Explorer case, similar in style to the Pelican case. The time keeping has been excellent. 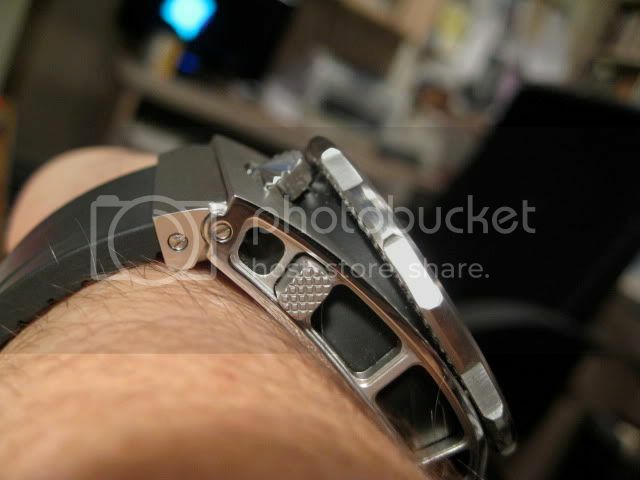 In summation, this is a marvelously engineered watch. Extremely comfortable, excellent visibility. My recommendation: try and find one soon. I have been fascinated by those ever since I first saw one. Just so different to other watches, and you've given a great insight into the functionality of the watch, which is what it's all about. great review, thanks for posting ! 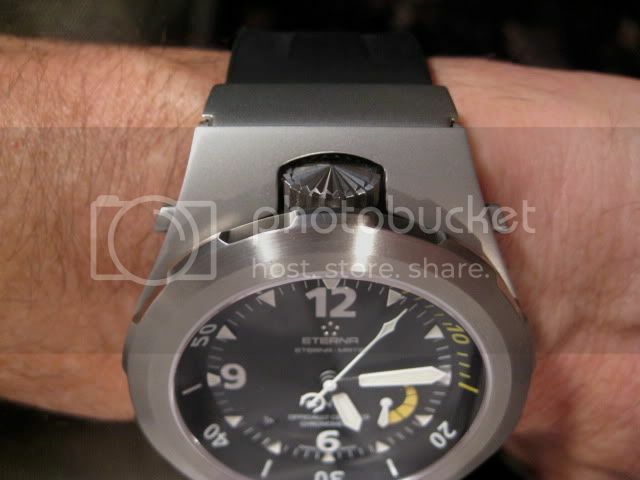 I really like the watch - very different and outstanding. Oh you have already cool! I had the temerity to classify my post as a Classic post? 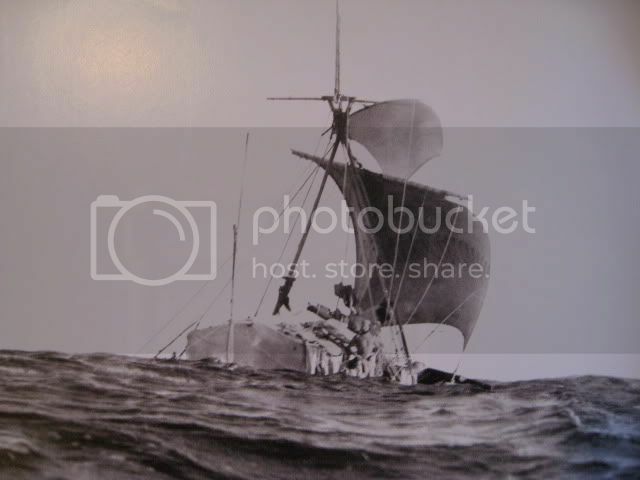 I must have slipped my rudder. The damn sheer pretentiousness of it! I promise not to succumb to overblown self-importance again. (Must have thought I was posting to Reviews). Hey, not many people bother with a proper review these days and yours is a goody... welcome aboard my friend... its all about the feeling!